The replica 3 volume type is the default and the only supported volume type that can be created using Heketi. Heketi can be configured and executed using the CLI or the API. The sections ahead describe configuring Heketi using the CLI. Disks to be registered with Heketi must be in the raw format. Heketi is supported only on Red Hat Enterprise Linux 7.
heketi-client has the binary for the heketi command line tool. "sudo": "Optional: set to true if SSH as a non root user. Default is false." "fstab": "Optional: Specify fstab file on node. Default is /etc/fstab"
After Heketi is configured to manage the trusted storage pool, gluster commands should not be run on it, as this will make the heketidb inconsistent, leading to unexpected behaviors with Heketi. Heketi does not have a mechanism today to study and build its database from an existing system. 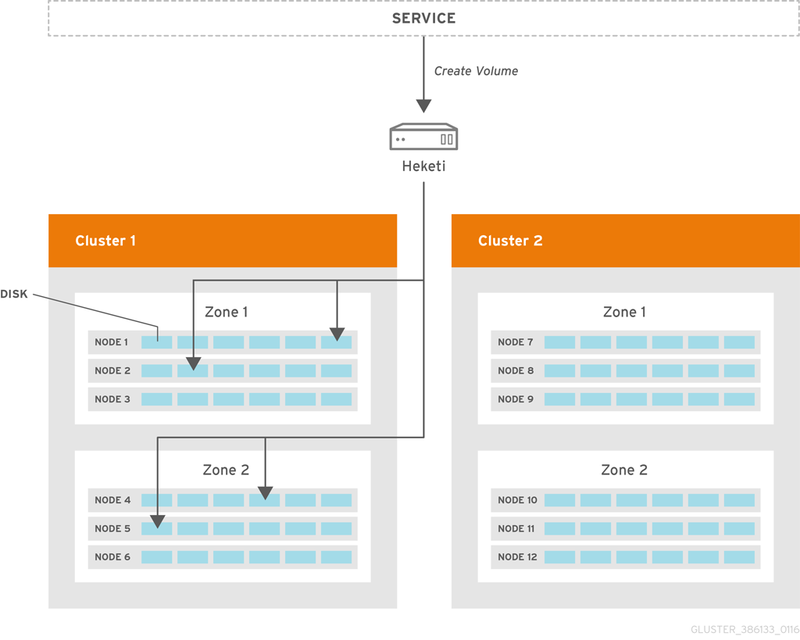 So, a new trusted storage pool has to be configured that can be used by Heketi. A sample, formatted topology file (topology-sample.json) is installed with the ‘heketi-client’ package in the /usr/share/heketi/ directory. node: Same as Node Add, except there is no need to supply the cluster ID. zone: The value represents failure domain on which the node exists. Heketi expands a volume size by using add-brick command. The volume id has to be provided to perform volume expansion. Find the volume id using the volume list command. This volume id can be used as input to heketi-cli for expanding the volume.